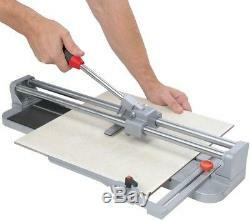 BRUTUS Manual Tile Cutter 20 in. Ball-Bearing Slide Die-Cast Aluminum Base. Bring ease to your tile cutting projects with this 20-in. It boasts a ball-bearing slide for smooth scoring. A rip-and-angle cutting guide makes quick work of cutting similarly sized tile pieces. With a durable die-cast aluminum base and chrome-plated steel rails, this tile cutter is built to last. Cuts wall and floor tile up to 20 in. Comfortable co-molded padded handle with storage for extra cutting wheel. Thick, heavy-duty rubber pads prevent tiles from shifting during use. : 27 Blade Material: Steel Color Family: Steel Cuts Through: Ceramic, Porcelain Flooring Product Type: Tile Tool Flooring Tool Features: Handle grip, Non-slip hand grip, Replacement blade Material: Steel Maximum tile cut size diagonal in. : 14 Maximum tile cut size rip in. The item "BRUTUS Manual Tile Cutter 20 in. Ball-Bearing Slide Die-Cast Aluminum Base" is in sale since Tuesday, August 28, 2018. 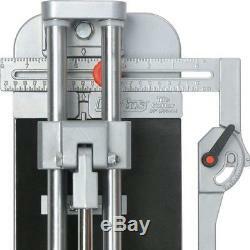 This item is in the category "Home & Garden\Tools & Workshop Equipment\Hand Tools\Cutting Tools". The seller is "homebuildersonline02-1" and is located in Tulsa, Oklahoma. This item can be shipped to United States.